Last video I talked about a strategy of betting called the martingale system. It’s a strategy where you always chase the total amount you’ve lost so far by betting that loss plus 2. So that when you eventually win, you win 2 guaranteed. A lot of you saw the flaw in this system was that the amount of money you’d need to sustain it would be infinite. The issue is, even if you have a really huge amount of money, as long as it’s finite, the expectation value from playing this game is 0. That’s because, with a very small chance, you’d run out of money to keep betting and you’d lose a lot. I didn’t believe this until I did the calculation, because it seemed like you were so unlikely to even lose many times in a row and so you didn’t really need to worry about getting to the stage where you’d need to bet big, so you didn’t have to worry about folding. But let’s do the calculation and see what happens. Everyone has some number of losses, that would mean they will have lost enough money that they wouldn’t be able to pay the amount they need to bet for the next round, so they’d have to give up. Let’s call this number of losses for a particular person, n. n can be very high or very low, it doesn’t matter. The person only has a 1 in 2^n chance of losing the maximum n times in a row. If they don’t lose then they win 2- that’s most of the time, with a the probability (1-1/2^n). But in the unlikely event they do lose, their total loss is this sum of losses so far, which we know is 2^(n+1)-2. So we put all of this together in the expectation value formula: the probability of not folding times the gain plus the probability of folding times the loss… and it magically works out to zero. The way to explain this is, when you play this strategy, with very good probability you win make a modest gain, but with small probability you will make a disastrous fall. It averages out to 0 in expectation. The higher your value of n, the less likely you’ll lose to you when you play. as n approaches infinity, the chance you can fail goes to 0. In this version, where the person can always afford to gamble more, they always make 2. As a lot of you pointed out, the casino also has a maximum bet for this very reason- so everyone has to stop eventually. So this strategy clearly doesn’t work- if you play it lots of times you’ll end up with 0 on average. But what if you only played a few times? And what if you capped your maximum bet at a very reasonable price- so that you really wouldn’t mind too much if you did lose, even though it does mean you’d lose more often. Let’s try an example. Say you set your maximum times of losing at 4. The probability of that is 1 in 16. So you’d think that you’d be pretty safe if you only played a small number of rounds compared to 16, for example, 4. You’d lose money unless you won every round. But the probability of that is only around 77%- no were near a guarentee, especially considering how much you stand to lose. Plus the amount you can win is just 8. In my opinion, you’d be way better off getting a job. That solves the paradox entirely for the real world as far as I’m concerned. But there’s still a paradox, in my opinion, mathematically. Let’s look at the game where the person paying never runs out of money. You might say, well that would require them to have infinite money already. Not really. Each time they play, they only bet a finite amount, and they can always borrow money to play because they’re guaranteed to make it back. You might say, well, there isn’t even an infinite amount of money in the world they could borrow. Sure, but maths doesn’t care about what sort of world we’re in -we could have been in a universe with different physics that allowed the universe to be infinite, and the maths would be the same. So this is the paradox, mathematically, for me. This random red or black game should have expectation zero. You just feel like that must be true. There’s no way to on average make money from a game of complete chance. But what’s the expectation of the martingale? Well it’s 2. You always win 2. Or using the mathematical formula, we can see the same thing. In fact, I can make this number anything I want- for example, say I bet 50 more than my total losses each time- then the expectation is 50. But I can make it worse again, by using this strategy, say you’ve lost a few times so far and it’s the nth round- then bet all that you’ve lost plus 2^n. Look at the expectation value. It’s infinite. So the real paradox for me is that you can some how take a game that you think should have expectation 0, and then actually make that expectation whatever you want, including infinity, yet when you restrict to only ‘realistic’ cases, you get 0. huh? This paradox showed me that my intuition about expectation values is wrong- there are situations where it breaks down badly. That’s why I really like paradoxes- if the mathematics is sound, it means what’s unsound is something in your own way of reasoning. It forces you to acknowledge that. I wanted to make this video for two reasons. One: to share my Death Valley experience with friends, family, and you. And two: for it to serve as a guide for those who might be planning their own Death Valley trip- a very loose guide, but a guide nonetheless. Death Valley is one of the hottest places on earth in the summer months temperatures range anywhere from around 100 to 120 degrees Fahrenheit -or more. So as summer approaches, my friend Bobby and I decided to squeeze in a short trip before it gets too hot. I’m at Bobby’s and I think he slept through his alarm, which is funny because the last trip we went on he also slept through his alarm. I was waiting for you to come out so I could record you and then your neighbor came out the other door and I wasn’t paying attention and I was just recording her. From Los Angeles, Death Valley is about a four-hour drive. It doesn’t actually feel that long though because the landscape constantly changes you’ve got green mountains, red rocks, farmland, small towns, deserts, and that kind of cycles until you get there. The plan for us was to make it a simple two-day trip: drive out Monday, spend the night in a motel, spend all day Tuesday exploring and then drive home in the late afternoon. I had already researched all the places we wanted to see so fitting it in would just be a matter of timing and managing any random adventures we wanted to take. Our first stop would be father Crowley Vista. Bobby’s choice. It’s where you can see military jets fly through the canyon. Bobby loves planes. Any time we drive past an airport he wants to stop or at least look so watching jets fly through Death Valley was a must for him. We read online that they fly pretty much every day. Some days you get quite a show and others it’s pretty quiet. We had no idea what we were going to get. So we found a nice spot on the edge of the canyon and waited and waited and then As ready as we were, it happened so fast. It came out of nowhere. There’s really no warning. As soon as we heard the jet and pointed our cameras at it, it was gone. At this point we were technically in the park but not down in the valley. That’s where most of the sightseeing is… and the heat. Bobby are you ready to feel uncomfortable for the next 36 hours? oh it’s hot 110. This is also where we ran into our first bit of trouble the air-conditioning in my car started blowing out hot air. Not good. We still had a day and a half left and ninety percent of it was down here. Death Valley is really just a lot of rocks, sand, and dirt, and heat but it’s also got character and that’s what makes it worth exploring. For example we found this ghost town on the very east side of Death Valley called Rhyolite. It was once a prosperous mining town in the early 1900’s. Now it’s just abandoned homes, a bank, and a very weird art museum. and then there’s the Mesquite Flat Sand Dunes. Probably one of my favorite stops of the whole trip. When you come down the mountains and see them in the distance, they look tiny, minuscule, but when you get up close to them they’re pretty massive. And you can just walk out as far as you want. We spent the night in a little town called Beatty. There’s really not much there: a few motels, a couple restaurants, and a Denny’s with the casino attached to it. In the morning we got coffee at a little diner and then headed back into the valley. Do you think it’s gonna work? I do not think it’s gonna work as well as it should. Does it feel cold? No. Wait, wait, wait. Yes it does. It feels mediocre. Bobby. No, that’s better. Yeah that’s working. Success. Day two was starting off strong. Badwater Basin was number one on my places-to-see list. It’s a giant salt flat, nearly 200 square miles. It’s also the lowest point in North America at 282 feet below sea level. For reference, there’s Bobby and there’s a sign for sea level. Bobby and I just walked out as far as we could. We’re still walking. The path is getting a little less traveled, a little rockier. Bobby is leading the way. We went early in the morning to avoid the extreme heat, but it was already pretty bad. Bobby heard that the salt here basically tastes like pink Himalayan sea salt so he wants to test that theory out. No good? That’s the saltiest thing I’ve ever tasted. I I’d put that on some steamed vegetables. Okay. Alright, so Bobby and I have gone as far as we’re probably going to go. It’s getting a lot hotter, a lot more nothing around here. We’re gonna take a few pictures and then probably head back. The plan for day two was the started Badwater Basin and then drive back up, hitting all the major stops as we made our way out the park. For the sake of time, I’ll just show you the highlights. Oh and my air conditioning stopped working again after Badwater. Our final stop was Dante’s view. You drive 20 miles up the mountain and you’re greeted with a beautiful view of the entire Valley. It’s cool, it’s relaxing, and as a nice wrap up to the day we could see our entire trip in the valley below. So it makes sense that I would end the video here, too, right? Well, I can’t. Because that’s not where this trip ended. As we were leaving, my car stalled out here. We waited a few minute, started to back up again and then it stalled out again here, in the middle of nowhere. I don’t know much more about cars other than how to change a tire, but I do know being stranded in Death Valley is one of the last places you want to be. There’s no cell service, no relief from the sun, and ranger patrol can be few and far between. There are a lot of details to this story but I want to keep it as short as possible, so here we go: Basically, we were able to stall out again in front of a restaurant that had the worst wifi ever. Here. I was able to get one text message through to my family in Michigan. My dad’s a car guy and would likely know something. He was able to call the restaurant and talk me through some possible scenarios. Since the car was still driveable, Bobby and I were going to make our way out of the park until we had cell service and were near some type of town so we wouldn’t be completely stranded. And somehow we made it. Just as we were getting off the highway in Lone Pine the car stalled again, the serpentine belt broke, and I was able to pull directly into a Comfort Inn. Side note: this is Mt Whitney. One of those is Mt Whitney. One of these. It’s the highest point in the contiguous US. It’s kind of cool that we got to see the lowest and highest points in the same day. Anyway, with shops being closed we rented a room, called the tow truck in the morning, and were towed to Ridgecrest 70-something miles away. Unfortunately the fix wasn’t a simple belt replacement and the total repair cost was 750 dollars. With all that said I did have a good time. It was a rough ending but we did get to see everything we wanted to and we didn’t get stranded in Death Valley. I’ll take that. Imagine getting the idea one day to sell everything you own, take the money to Las Vegas, and bet it all on a single spin of the roulette wheel. It sounds crazy. The risk of losing is very real, and you could very well be walking away with just the clothes on your back. In fact, the chance of winning in an all-or-nothing red/black bet on an American roulette wheel is 47.3% (48.6% if playing on a European wheel). Ashley Revell of the United Kingdom decided to take that risk when he sold everything he owned and bet the resulting £76,840 (about £105,400 or $164,286 today) on red in Las Vegas during April of 2004. Thirty-two year old Ashley Revell’s journey to risking his life savings in Vegas began, by his own admission, over drinks in a pub with friends. One friend brought up the idea of betting everything on a single spin of the roulette wheel, and the slightly inebriated group agreed it sounded like a good idea. Despite the conversation being alcohol induced, the next day, the idea still stuck out in his mind. He later told the Telegraph, “I thought what an amazing experience it [betting all of his money] would be. At the time I wasn’t married, I didn’t visit this website. I was completely single. It was now or never.” It should not be surprising that not everybody supported his plan, and both of his parents opposed the idea. Revell’s father, Mick, told his son that he was a “naught boy”, that he shouldn’t go through with it, and “He should work like all the other kids do.” Ashley spent time convincing them to support him in the endeavor. His father caved first, but his mother took a bit more persuasion before agreeing to support her son. So he took the next step and began selling all of his possessions and raising a bit of extra cash any way he could. His BMW car, a Rolex watch, golf clubs, and even sentimental items were either sold at auction or during boot (trunk) sales. Some items were harder for him to part with than others, especially soccer trophies and a cricket jumper he received while playing in high school. Afterwards, Revell admitted he regretted selling those items. Eventually a television crew from the British TV channel Sky One heard about his plan and created a TV mini-series titled Double or Nothing. Tallying it all up, after selling everything and acquiring funds from other sources such as being sponsored to change his name to “Ashley Blue Square Revell” by a UK online bookmaker, he managed to compile a very respectable total of £76,840. With the money in the bank ready to be wired over, he boarded a flight for Las Vegas with the camera crew, his friends, and parents in tow. He didn’t even technically have the clothes on his back at this point as what he was wearing was a tuxedo he rented specifically for the occasion. Plans to place the bet at the Hard Rock Hotel fell through after negotiations broke down with the casino. However, the owners of the Plaza Hotel and Casino seized the opportunity for publicity and agreed to host the roulette game, though directly before he placed his bet told him that they did not advise that anyone, including him, go through with something like this. Despite the risk, the night before making the life-changing bet, Revell slept well and later said did not doubt his decision to go through with it. Despite the odds technically being slightly against him, he stated, “Thinking back it seems crazy but I was so convinced I was going to win. I was literally going down there to collect my winnings.” However, he still had not decided the answer to an important question: would he bet everything on black or on red? He waited most of the morning for a sign telling him which to choose but none came. In the end, according to Revell, directly after the ball began to spin, “The first thing that came into my head was red, so I just pushed all my chips forward.” With many family and friends there with him watching, along with the audience of Sky One‘s show back home, the ball circled the board before landing on a number- seven, a red color. Revell had doubled his money on one spin, giving him £153,680 (about £210,800 or $328,572 today). He admitted after the experience that, “… it was a mad thing to do. And I’m thinking back now about what would have happened if I lost. I’d have had nothing to go back to, nothing to wear. But I’d still have my friends, my family, and they’d always be there for me. So they gave me the security to be able to do this.” Unlike most who win big in gambling, Ashley decided that tempting fate once was enough for him. He declined to bet a second time and cashed in his chips at the table and walked away. As for what happened after, Revell spent a small portion of his winnings on a motorcycle trip around Europe, where he met a girl while in Holland. “I took her back to England with me, we married and now we’ve got two children. You could say I have my bet to thank for finding me a wife. ” One of the many viewers who watched Ashley Revell on the Sky One television program was Simon Cowell. Cowell was inspired by Revell’s all or nothing bet to create the television game show called Red or Black. Hi guys welcome to another video. This system is called when the sleeper awakened so we’re talking about dozens here. So what happens? Is we wait for a dozen to sleep or in other words, not get hit for a minimum of eight spins, and then we we wait till it’s hit, and then we bet two for splits, which is a split, is two numbers. So there’s four chips on four splits. So what would happen is we’ll do a demonstration. So that’s the easiest way to explain it. So we’re going to wait for a dozen to sleep or not hit, so you can either write this down, keep track or after a while, you get to know which numbers are in which doesn’t so you can keep it in your head, which I do. Okay, let’s get started so we’re waiting for the Dozen one of these dozens to not be hit for six, and that starts the trigger. So, let’s see there, we go zero. Well, that’s out of the way there zero for a while, so keep a track. So at the moment you can see that the third dozen hasn’t been hit for three. We can include the zero so for four spins so far, five pins, five spins, sorry, including the zero two forces, so I did get hit so now we’re looking. You might want to write this down, but obviously you can see there. The first dozen hasn’t been hit for four, so let that’s the oldest dozen that hasn’t been hit. So let’s track that one so oldest, doesn’t four: five has being hit, has been hit. So now we’re back two dozen three sorry dozen to Tara doesn’t tell he’s been hit. So now we we tracked back to the oldest, which is a so just keep that after while you get used to it in your head, so back to the one is the oldest sorry three back to the let’s hit it back to this third dozen or hits Five six, so the third dozen thirty five was the last number in the third dozen to be hit, so has been six spins since then, where it hasn’t hit. So now, when it does hit, then we start betting on the column streets. We can call it okay, it’s been here, so it’s been hit in this column. It’S a twenty five. So what we do? We bet the splits for splits in the other two columns in that dozen. So, as you can see, there there’s a progression system. I like to stop probably at about you, know the tenth one or so because it does get up there because again it’s a progression system, some of my favorite system, but again I’m just showing you all the systems out there and you can decide the ones with The work for you, okay, let’s do now four spins, because after four spins of one unit, then obviously we don’t get our money back. So then we got ta up the units to another one. There we go well. We hit the first one, which is the best result we can get so we got 14 profit so that completes the system there. Let’S do it again for ten units on the first, so pretty happy with that one. Obviously, sometimes it doesn’t happen all the time. So this is the risk you take obviously, but I try I try and have the the lowest start with the lowest units. So, let’s find another online casino no deposit bonus that hasn’t been hit for six spins, so we could actually still use this as a trigger, but they’ve all been hit. Quite recently, so, let’s there we go for the next one. So second dozen hasn’t been here for three four: five: six, okay, so looking at the second dozen, so as soon as it hits, then we bet the four splits there we go. The thirties has hit in the second dozen. So again we move to the other two columns where it hasn’t hit and put one on fourteen seventeen split: twenty twenty, three fifteen eighteen and twenty one, twenty four. So four four spins one unit, two three four, so I hit on the the fourth spin with one unit that’s before we obviously increase that, as you can see there in the table to two units we still want to. So that’s the minimum there. So this is how this system works. He has a reasonably do crude, reasonable, reasonable degree of success, but again it’s a system that can go against you quite quickly and you’re betting units do go up quite quickly after the the first five or so losses. Good things about the good thing about the system is that you can actually win quite a lot of Units it does. It does take a bit of time sometimes to get that six. Six on hit dozen area, the negatives really okay, the units can go up quite quickly. You can have a losing run so I’d call it a medium type risk of system. It does cover eight eight numbers, so you are covering about just over twenty one percent of the board. Hi, my name is Charles and I’m here to try to tell you how to play Spades. Spades is what’s called a partnership card game, usually you play with four players and the players that sit opposite each other are on the same team. The purpose of the game is try and take as many tricks as possible. A trick is when each round, each player puts down one card. When four cards are put down that card of the highest value wins whats called the trick. You then pick that trick up and then play more. At the end of the game, you count up the number of tricks and the player that win, that took the most wins. Now in Spades there are couple of different things that change. The first is that the spades are always that are considered trump, which means that, if you have any of the other three suits in a trick in a spade the highest spade will win the trick no matter what the other cards are. So an ace of hearts for example, wouldn’t take a trick if somebody put a two of spades down. The other thing that you have in Spades is what’s called bidding, which means that once you’ve dealt out all the cards to the four players, each player has thirteen cards, you pick up your cards and you bid how many tricks that you think you’ll be able to take. So if you think you have a really good hand and out of the total of the thirteen tricks you think you can take five, then you would bid five. Now your partner is also going to bid a number of tricks, and your total contract or the number of tricks that the two of you are going to be able to take, is the sum of that number. Now a couple of interesting things in terms of scoring, at the end of the game you count up the number of tricks you have and you compare it to the contract. If you take ten points for each trick that you take, if you don’t take all of the tricks in your contract you actually lose ten points for each trick that you didn’t get and you don’t get any points for the tricks that you did get. If you take more than your contract, you get the points for your contract plus one point for each additional trick. So your goal is try and get the number as exact as possible. If you bid zero tricks and you don’t take any tricks, you get a hundred points at the end. And if you and your partner bid zero tricks and you don’t take any tricks, you actually get four hundred points. You play the game usually until you get five hundred points and sometimes you can even go over what’s called a back hangover, which means that you take, out of you say you’re going to take five tricks and you take seven, so you get fifty-two points and that two points puts you over the edge. That’s a perfectly legitimate way to win. The last thing to say about Spades is that there are dozens of different ways to play, it’s probably the most popular partnership game in the country right now. And so if you have a different way of playing, by all means go ahead and use it. Spades is a great game. I hope that you enjoy playing it. And that’s how you play Spades. Atea-Time top-of-the-table tussle between Chelsea and Liverpool, Jose Mourinho and Paul Pogba in front of the Sky Sports cameras again and Arsenal going for a seventh win on the spin (. Yes, you read that right, ) Sit back and enjoy a super Saturday in the Premier, League.There’s eight games in the English top flight today and we’ve got the best bets for every one. There’S also the top picks across the Football League and north of the border.West Ham must be rubbing their hands while watching the lastest episodes of the Manchester United soap opera, directed by Jose Mourinho, starring, Paul Pogba filmed by Sky Sports and shown on almost every website. From Salford to Singapore, There’s not a lot of love around Old Trafford following the draw with Wolves penalty, shooutout defeat by Derby and the Pogba-Mourinho bust-up, taking a somewhat toxic turn. Meanwhile, the Hammers have been recovering from their shocking start to the season and took another big ( ish ). It was only Macclesfield step in the right direction by smashing home EIGHT goals in midweek. If this had been a week ago, it would have been much easier to back the visitors.They’ve lost only one of their last 19 Premier League games against West Ham and have been better away from home this season, But with the Pogba row starting to split the camp. It could be worth siding with the hosts. They are 18/5 for the win and 11/2 ( Sky Bet ) to win by a one-goal margin.It’s, 9/10, United or 11/4. They win by the odd goal. We were raving about Watford when they kicked off the campaign with five straight wins, so it’s only fair that we get excited about Arsenal after they went one better by beating Brentford on Wednesday night, Even the die-hard Arsenal fans or the thousands who dressed up as empty Seats against the Bees wouldn’t have tippedUnai Emery to get them clicking so early in his reign, but he’s doing a grand job and after six wins on. The spin should be backed to make it a magnificent seven. On Saturday, The Emirates Stadium should be a bit busier than it was on Wednesday, and you have to go back more than five years. For the last time, Arsenal lost at home at 3pm on a Saturday Aston Villa on the opening day of 2013-14. The Gunners are no better than 4/9.They are 17/10 ( Betstars ) to win with both teams scoring and Alexandre Lacazette (. Three in his last four ) is 9/2 ( bet365 ) to open the scoring. There’S, no shame in losing to Arsenal the form they’re in right. Now but Everton were kicking themselves as they left the Emirates Stadium. Last weekend They were the better team for spells had more shots than their hosts, ( six on target and 10 in total ), but paid the price for poor finishing It stretched their winless run to three games, but the stats lovers among the Goodison Park, faithful, will Expect to get back on track in a fixture, they’ve won 21 times in a row, And yes, that is a record in the English top flight.But. Anyone looking at the stats will also have noticed Fulham’s, Aleksander Mitrovic’s name at the top of the Premier League scoring charts ( alongside Eden, Hazard on five goals ) and his late effort denied Watford at Craven Cottage last time out. Both teams to score looks the best bet here at 8/13, while Mitrovic is 21/10 (, Betway ) at any time, Huddersfield boss, David Wagner, is playing it cool, despite his side, propping up the table with no wins, and the German insisting’there is not much between us and The other teams, the gap, is not big’Well, that’s not strictly true. The gap to Saturday’s opponents is 10 points and should be an unlucky 13 by the final whistle Spurs were better early in the season and in five games since beating Man United. They haven’t matched the display from that night at Old Trafford, but Huddersfield could present them with a good opportunity. Spurs won both league games last term scoring six and conceding none while the Terriers are still without a home goal. In 2018-19, The visitors are 4/9 or 29/20 ( Bet Victor ) to win without letting one in.They say that how you respond to a setback is crucial and since going down to that shock defeat by Lyon, Man City have spanked Cardiff and Oxford scoring eight goals over Two games without reply: It should be more of the same when 33/1 shots Brighton visit, the Etihad Stadium City are no better than 1/10. Brighton can take some heart from their most recent games against the big guns. As this season, they’ve beaten Man United and only lost by the odd goal to Liverpool and Tottenham, but there’s only going to be one winner here. A 3-0 victory for City is 6/1, with a few bookies and we’ll be on them to make a fast start and score. The first goal between 11 and 20 minutes at 18/5, When you’re, desperately seeking your first win of the season going up against a team. You’Ve lost five of the last six meetings with isn’t ideal. That’S the situation. Newcastle are in as Leicester head for St James’ Park. A ground they’ve scored three goals at on each of their last two visits. Another Leicester, win is 2/1, with several bookies and 2-1 to the visitors can be backed at 11/1 ( bet365 ). The Magpies have lost all three of their home league matches to Spurs Chelsea and Arsenal by that scoreline Wolves can be happy with their start to the season, especially after draws with both Manchester sides. But it’s worth noting that since the opening-day 2-2 draw with Everton they’ve only once in seven games scored more than a single goal, and that was against Sheffield Wednesday in the League Cup. Saints were on two wins two draws and two defeats before going down at Liverpool. Last week – and this looks like the type of game they’ll lose The hosts to edge, it is the shout they’re 17/20 to win 5/2 to win by a one-goal margin. While 1-0 is 11/2, It was all red early on and then a huge swing saw blue, dominate the scoreboard, as the Ryder Cup got off to a thrilling start yesterday, and we could be in for a similar ding-dong battle at Stamford Bridge between the high-flying Blues and Reds of the Premier League Jurgen Klopp, was seeing red this week getting a bit angry after the midweek Cup loss to Saturday evening’s opponents, and the news that Virgil van Dijk is struggling with injury has done nothing to turn his frown upside down, especially with Eden Hazard. The great appeal of slots is the fact that they offer besides fun, we offer the possibility of a jackpot in a very simple, leaving the neglect any skill for the game. Today there are many styles of slots, although we could divide between progressive and basic. When checking into a real money online casino nz, have access to a wealth of online slots, which are almost the same as traditional slot machines, which are differentiated by technology that they employ. Multiline online slots are those in which the player must bet on each of the lines you want to enable. In them, the player will have the option to choose to bet on all lines at once or just a few. The larger boat will be delivered only in case of winning by making a bet on all lines. In many online casinos, slot machines are interconnected, offering a progressive jackpot. The total of the pot is very large, since it is constantly growing due to gambling losses by the players. On the other hand we find the common slot, which are independent. The amount of money that these machines can only depend on the amount contained therein and the award will be determined according to the table payments to such slots. In this type of online slots, the jackpot is fixed. For bonus slots, it is necessary to align certain symbols to get the bonus, which will allow the player to access a jackpot. Slots multiple communities are those that fall within the award to deliver will depend on the number of coins bet, in addition consisting of a single payline. The bonus multiplier slots are different from previous ones only by the fact that they add a certain amount of money in the pot. To access it the bettor must play the maximum amount of coins and win. Thanks to the huge online casino slots game has become increasingly popular. We must not forget also that there are casinos that offer playing slots online for free. This is an opportunity we should not miss. 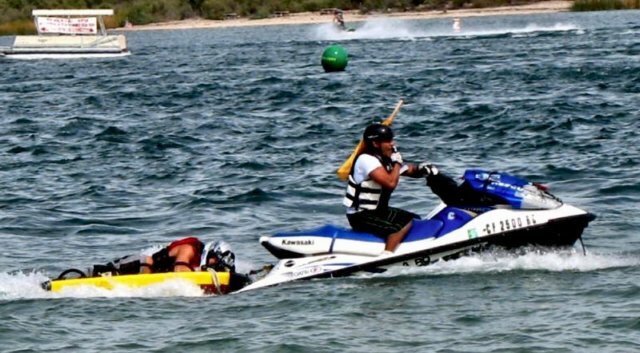 Safety: Jet skiing operation isn’t a joke! Jet skis are no longer the little machines they use to be back in the 70s & 80s. Their engines have grown to be very powerful. A 300cc small 2 stroke engine has grown to a 1500cc one, supercharged 4 stroke, capable of producing 250 hp from factory with speeds close to 70 mph. A very dangerous watercraft in the hands of the wrong individual. It’s possible, for an inexperienced first time rider, to go into a jet ski rental place and come out with a 60 mph personal watercraft. The internet comes handy with many web sites offering PWC safety courses and making it easy to learn by watching a PWC safety operation video online! How old should the jet skiing captains be? The personal watercrafts industry support a minimum age requirement of 16 to operate a PWC. Lately, most states are requiring training because the 900 pounds personal watercrafts of today, with the big engines, in the hands of untrained operators could become lethal weapons. Some state allow even younger teenagers to go jet skiing by themselves but they are wising up. Like with cars, there isn’t a national age requirement. It’s easy to see what is going to happen to the restriction free jet skiing we have seen in the past. Should personal watercraft operating license be mandatory ? Stronger safety regulations and rules will emerge making personal watercraft operating more complicate but, even though it would be safer than ever, the statistic will still show more accident than in the past. The reason for higher numbers will be because more people are buying jet skis every year. To look at the good side of jet skiing, a few years ago a kid, any age, could take out a motorized boat all along. Hey, don’t feel so bad about a 16 year old teenager riding a jet ski by himself, he could been riding an 35 footer offshore racing boat instead. At least, in California, they have to be 16… No bad! I was a full size boater for 25 years before getting into personal watercrafts and now, even though I’m almost 60 years old, I can’t get away from riding PWC. Unless you want to carry dry passengers with you, jet skis are easier to use, funnier, cooler and cheaper to buy. It’s a lot easier to use, maintain and store jet skis than it’s with traditional watercrafts. Jetskiing even give you a workout as a side effect. The jet sking sport is growing at a very fast rate. If we all, as a group of PWC enthusiasts, promote safe and responsible riding by example more people will join and use of pwc. Just ask yourself these questions honestly. And these are just the ones that came to mind right off! Here comes the ugly side of the sport: The Jet skiing accidents. 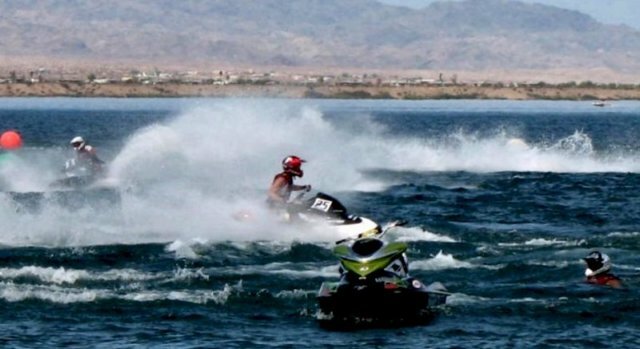 I was at the 2006 Jet ski World Final Championship event at Lake Havasu, Arizona. 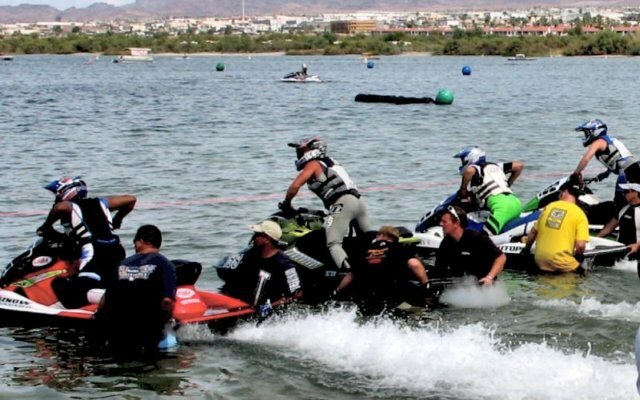 In one of races for that day, 2 jet skis collided, while making a closed turn at a buoy right in front of the spectators, I was taking pictures, the jet skiing accident occurred so fast that it isn’t possible to see the exact hitting time. These racers go extremely fast and things get very confusing during the race so, after the hit, a Seadoo RXP that had been doing good was now idling near the unhappy looking racer while many other racing jet skis kept on passing dangerously close to him. Before anything could happen to the racer there was a rescuing jet ski patrol, with a little rescue sled in the back, taking him away to a shore safety area. The water rescuer patrol was provided and paid for by the event organizers. Nowadays you see patrols watercrafts at most lakes, river and beaches. I don’t know how much money the guards make but I think they are very happy! What about personal watercrafts occupations? Personal watercrafts are related to many occupations using different types of jet skis depending of the purposes of the jobs. Because their size and maneuverability, jet skis are widely used by the US Coast Guards, river police, and for emergencies by water rescue patrols around the world. A very handy rescuing vehicle, to get in and out, where a full size watercraft wouldn’t be able to reach in. The jet skis small draft make them ideal for landing at the beach and running where water is only a couple of feet deep. In reality, jet skis are mini jet boats that were originally designed only as a toy to be ridden standing up. Later on they were called PWC! Jetskiing Hollywood as a jetski stunt man. Another way to make money and enjoy jetskiing at the same time is by finding a jetski stunt job in Hollywood. Money should be really good doing this type of work since the risk involved are higher. Some time they require a whole bunch of jet skis in the production of a movie… Remember the “Water World” movie? It could also be in television series, where they use jet skis regularly… The “Bay Watch” show lasted for a very long time. When it comes to jetskiing, money can go in two different direction. It could be a big money eater or a good, thrilling, and fun money maker! 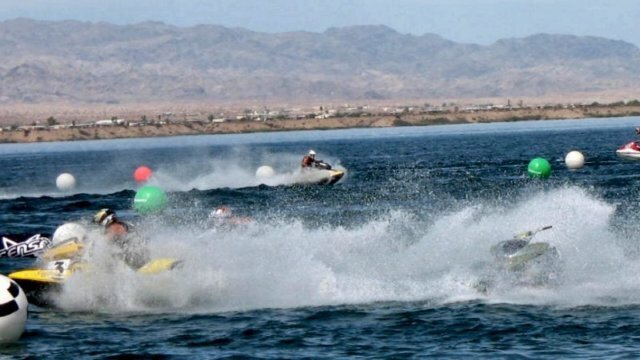 Is any money in personal watercrafts racing ? Another jetskiing occupation, or job, is as a PWC racer. But to get the good money you have to reach the very top. The winners of top, professional, races can make money while using their racing jet skis, the money comes from the endorsing sponsors. Famous personal watercraft racer can also make money by setting up related shops, an online PWC store, and from making commercial videos!